What a way to end the summer. With just two days left in the season of sun, I spent the waning days of the 2015 regular season where it started: in the rock pile cheap seats at Coors Field. If you remember, I began my quest this year by attending the Rockies’ opening day in April. It was also my first foray to the dark side. For lovers of hot dogs and all things processed meat, the dark side is where the new age hippies live. Those freaks of nature that do not consume the flesh of animals…in other words: communists. But temptation and curiosity got the better of me. 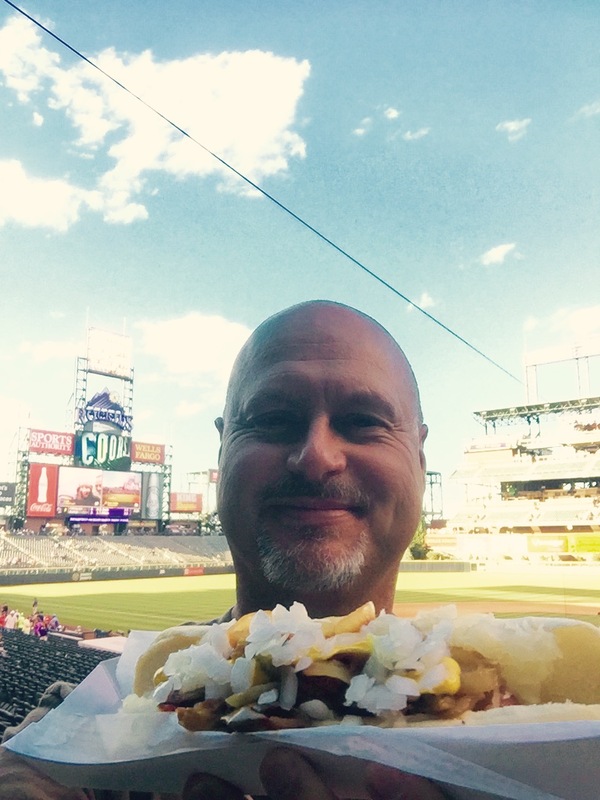 Having tried the regular dog at Coors Field in 2014 and the Taco Dog in 2015, I was left with one option: the veggie dog. That’s right, I went meatless at the ballpark. For a hot dog explorer it is sort of like showing up for work naked. I don’t have a rating system for veggie dogs, but I have actually had a few here and there. They, just like meat dogs, run the full spectrum from pretty good to pretty awful. None come as close as being as tasty as a Hebrew National on a bun though. The reasonably- priced veg dog comes on an oversized bun. It is sort of like the Dodger Dog in reverse. The Dodger Dog’s frank sticks way over each end of the bun, whereas the veggie dog frank at Coors Field has about an inch of bun extending past the roll of liquefied and congealed vegetables. I’d like to say it tasted good, but frankly it didn’t taste at all. I mean it seemed to have no taste. It was like a tube of meat-colored nothing on a bun. What helped was the generous portion of condiments put on the dog by the staff. The frank was really just a filler. And it far from filled me up. I immediately chased it with a 24 ounce Coors and a bag of peanuts. Did I hate it? Are you kidding me? No, it didn’t taste good, but I ate it sitting in the cheap seats at a Major League baseball park watching the home team put the big hurt on my hapless Padres. And despite it being meat-free, being tasteless, and witnessing my favorite team take a shellacking, I was at the ballpark with a dog in my hand. And it don’t get no better than that. After logging nearly 23,000 miles behind the wheel, countless gym showers and nights sleeping in my car...and a few extra pounds...I have the information you have been waiting for. You may have noticed that I have been absent a few weeks. It had nothing to do with my move to New Mexico, it had everything to do with getting time allotted on NASA’s supercomputers to crunch the numbers of all of the data I accumulated. And now, on par with the moon landing, I can tell you without a doubt which Major League Baseball team has the best specialty hot dog. In fact, I am pretty certain this information will help mankind more than all of that gravel we brought back from the moon. If you have been following my blog, you probably already know the answer. I have also included a chart for those that cannot read and Giants fans. 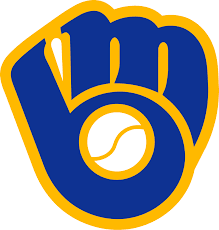 If you know baseball and processed meat, you should find it no surprise that the team with the best specialty dog in the MLB is: THE MILWAUKEE BREWERS. Milwaukee is the the encased meat capital of the world. Plus, if you have ever been to Miller Park you have seen the fans tailgating in the parking lot. No serious Brewer fan would ever show up to the ballpark without Milwaukee’s version of a holy shrine: the grill. Fans grill their own franks, sausages, kielbasa, and the occasional burger while waiting in anticipation for the gates to the Brew Crew show to open. If anyone knows hot dogs, it’s Brewers fans. And if you want to make fans that are experts in what a great dog should taste like you had better offer up something big and fabulous. That is exactly what the Brewers concessions team has done. The Down Wisconsin Avenue Dog now reigns supreme as the dog to down in baseball. It was the only entry to get a perfect score. They were able to pull it off by offering a ginormous dog made with quality toppings at a great price. It all comes together in Milwaukee, the baseball hot dog center of the universe. Congratulations Brewers fans. The surprises. Well, you might be surprised but not me. Two of the most storied franchises in baseball history, the Red Sox and the Yankees, end up on the bottom of the scale. The Red Sox in particular need hot dog help. I’m available. Also, I have to mention two minor league teams that rival the majors: The Lehigh Valley IronPigs and the Akron Rubber Ducks. The two-foot meat bomb the IronPigs offer would crush most MLB entries. And the slaughterhouse on a bun called the Three Dog Night in Akron is a unique three-meat dog that makes any meat lover's knees weak. Well done. So what is in the future for your Hot Dog Explorer? Firstly, lots of hiking and running to work off my newly acquired hot dog gut. It was actually the sedentary nature of eat, drive, sit at game, sleep, drive, repeat that caused that. FYI I can still see my shoes. Then there is the Arizona Fall League to explore now that I live in the southwest. Plus, as promised, I will be posting some of the non-baseball Hot Dog Hot Spots I visited on my trip. Lastly, I am working on the sequel to “Gone to the Dogs” that will chronicle my trip this summer entitled “Doggone Good.” You are buying my book aren’t you?